In my opinion, the ideal school library is highly liberating and able to provide a learning environment that's not generally feasible, practical, or even possible in most traditional classrooms. 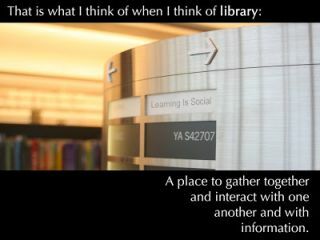 While there always seem to be exceptions to every rule, I think that our libraries should be comfortable, collaborative, open, social, connective, modern, clean, up-to-the-minute, and with shooshing not generally required. In order to create this kind of liberating environment for today's student, technology is most definitely required. Now that the dust is beginning to settle from the last month’s passionate discussion regarding the important changes taking place in our school libraries (and how technology and new media now play an increasingly integral role), I think it would be healthy to revisit a number of the questions posed and statements made. What role might a social media specialist have in our schools? What's the point of having a media specialist if they aren't specialists in the media forms of the day? Forgive me if it hurts. In my mind, if you are not an expert in new information and communication tools, you are NOT a media specialist for today. It's time for media specialists to tailor their role to the current reality. If your customers are able to do what you once were able to do for them, you'd better start finding new ways to add value to the school. Does a school need a library when information can be accessed from the classroom using Internet connected laptops? The new question is uncomfortable, messy, and incredibly important and not restricted by any means to one particular school. It is one to which all library people need a clear and compelling answer. A library is, to my mind, both a service, and a place for people. If the librarian and technology staff are viewed as not having knowledge that is sufficiently relevant to implementing and teaching IL/IT skills, the book room can be staffed by clerks and the techs can keep the e-mail server and student information system up and running from a small hidden office until those applications are outsourced. At the same time, if a school truly decides they want all their students to graduate having mastered a sophisticated set of IL/IT skills, having learned how to solve real problems creatively, and having experienced the power of global communications and collaboration, then a lack of resources - physical plant, equipment and human expertise will truly undercut this effort. Such an undertaking will require 1:1 laptop programs, well-stocked print collections, productivity labs, a fast and powerful network, good online materials, and, of course, a crackerjack professional staff to support both staff and students. The truth resides not in that somehow media specialists aren't important. It lies in the fact that the way schools are using media specialists is grossly inefficient. As Information Specialists, we MUST be familiar with new tools so that we can help our students and staff communicate, collaborate, and create in our increasingly connected world. Library walls are coming down. We need to keep up or we'll become obsolete. So, what do you think about the above questions and statements? Do they resonate true? If not, then why not? What is your vision for the ideal school library and what role do Media Specialists play? Quotation embedded in image: Carolyn Foote, punctuation altered. Original image: Flickr user sylvar.